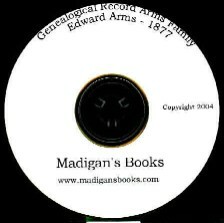 Originally published Edward Arms, Troy NY, 1877, This is a reporduction on CD. 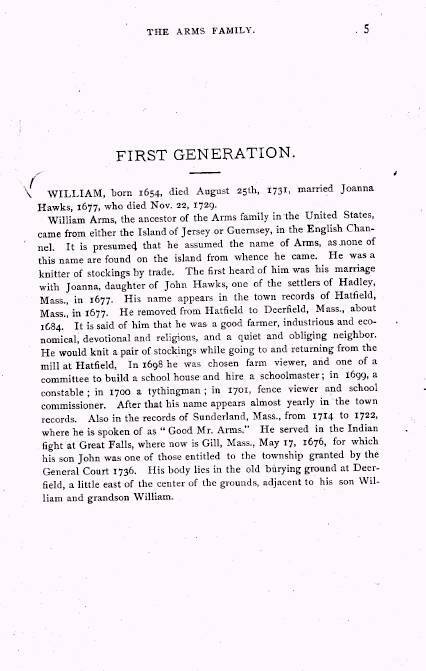 57 pp, index, William was born 1654 and died 1731, married Joanna Hawks in 1677, lived England, Hatfield, Deerfield and Sunderland MA. About five pages have correction notes in the margin from a previous owner. Descendants can be found in CA, IL, MI, NY, MA, IN, VT, TN. Even through the title gives the impression that the author did only the male line he added an appendix of some female lines. Some of the surnames of daughters are Abel, Avery, Berry, Bidwell, Bigelow, Bruck, Carleton, Chapin, Chapman, Clarke, DeGoyler, Dungan, Fisher, Freeman, Gilbert, Goodell, Goodnow, Hastings, Havens, Herbert, Higgins, Hitchcock, Holden, Horton, Hosmer, Mann, Mattoon, McNickle, Metcalf, Mosely, Parsons, Payne, Plumer, Pratt, Shedler, Timmons, Tuck, Wells, Wick, Wilder, Wright. About the CD: This CD provides the genealogist the opportunity to have access to information from a book that is difficult to locate in the used book market. The CD requires Adobe Acrobat Reader to view the file, the latest Windows version is included with the CD. The Mac & Window readers can also be downloaded from the Adobe website. The information on the CD can either be printed out and read in the traditional manner or viewed with your computer. When viewing on your screen the page size can be increased to make reading easier. This CD is not search-able but has a series of bookmarks making navigation through the file easier. The CD is packaged in a projective sleeve.